The Columbia forest region occurs in the wet belt of southern eastern BC between the central plateau and the Rocky Mountains. This forest region occurs at lower elevations along river valleys, and is interspersed with subalpine forests. A mix of western red cedar and western hemlock, with some Douglas-fir, grows throughout the region. Characteristic wildlife include grizzly and black bear, woodland caribou and mountain goat. 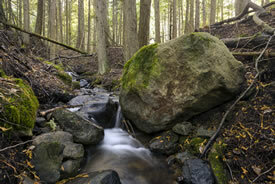 NCC has protected the Midgeley Conservation Area, an important wildlife corridor located in southeastern British Columbia.